Like most professions, the water treatment industry runs on initials. Here are a few more. There is often confusion about the threads on the fittings and connectors used in water treatment in particular and small-pipe plumbing in general. Things used to be more complicated when undersink plumbing had such exotic creatures as flare, fine flare, and Texas fine flare fittings to contend with. Now almost everything is done with compression fittings, pipe fittings, or the super convenient plastic push-in fittings. The push-ins are easy. With threaded fittings, what confuses people usually is the distinction between a pipe fitting and a compression fitting. The picture below has both threads. It’s hard to see the difference, but there is a difference. The taper of the threads is what actually distinguishes pipe from compression fittings. 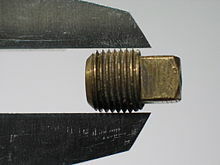 On bottom of the fitting in the picture is a male pipe thread; on top is a male compression thread with nut. Pipe threads connect the fitting to another solid component, like a filter housing or a rigid metal pipe. 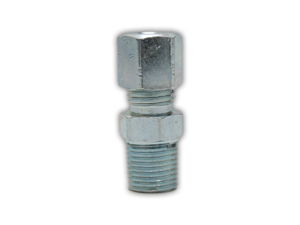 The compression fitting with cap connects a tube to the fitting. The pipe fitting is taped with teflon tape to insure a seal. The compression fitting is not taped. The real confusion with pipe fittings comes from the fact that they have so many different descriptive names. MIP stands for Male Iron Pipe, or some would say Male International Pipe. The same pipe size can also be called MPT, for Male Pipe Thread. FIP means Female Iron (or International) Pipe and can also be called FPT for Female Pipe Thread. The gentle taper of the pipe threads can be seen when it is viewed in the calipers. I won’t bore you with the actual taper of pipe thread patterns. The main thing you need to know when dealing with water treatment equipment is that compression caps won’t work on pipe threads and you can’t screw male compression thread into a female fitting (like a filter housing port) that’s made for pipe. See also Pure Water Annie’s Glossary of Water Treatment Terms on the Pure Water Occasional’s website.